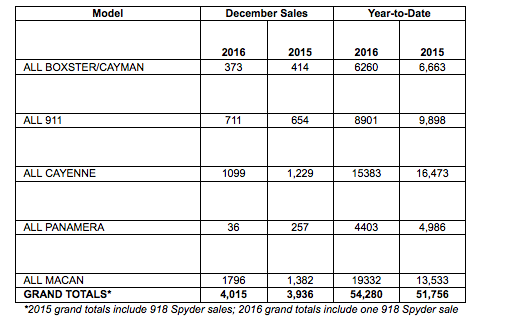 Porsche Cars North America, Inc. (PCNA) announced December 2016 sales of 4,015 sales and total year deliveries at 54,280. This marks PCNA's 7th consecutive year of increased sales. "Our product offensive continued to thrive with the arrival of 23 new model variants in 2016. As a result, we achieved our seventh consecutive year of increased sales," commented Klaus Zellmer, President and CEO, Porsche Cars North America. "I am confident we will see steady growth in 2017 with balanced supply and demand." "Macan sales accelerated strongly in 2016 with the introduction of new variants. Porsche plug-in hybrid sales were also promising with 2,111 Cayenne S E-Hybrid models retailed, a 92 percent increase over 2015," said Joe Lawrence, Executive Vice President and COO, Porsche Cars North America. "In 2017, we look forward to the highly anticipated, all-new Panamera, as well as the first full year of sales for our new 911 and 718 sports car models." Porsche Approved Certified Pre-Owned vehicle sales in the United States were 1,730 for December 2016. CPO sales year-to-date stand at 16,981 units, a 15.1% increase compared to the same period in 2015. Brandon Marshall Loses Bet, Keeps Porsche, Charity Big Winner!